Brutalism: a 27-storey slab block is next up in our Brutalist buildings series. As the precursor to the larger and more famous Trellick Tower, Ernö Goldfinger's Balfron Tower in east London was a testbed for the architect's utopian housing ideals (+ slideshow). Completed in 1967 in Poplar, alongside busy traffic artery the Blackwall Tunnel, Balfron was the first chance for the Hungarian-born architect to realise a vision for large-scale public housing that had been in development for over 30 years. The most striking characteristic of the building is the composition of volumes that makes up its distinctive profile. Like the Trellick, its younger and larger sister, the structure consists of an apartment block and a separate lift tower, connected on every third level by bridges. 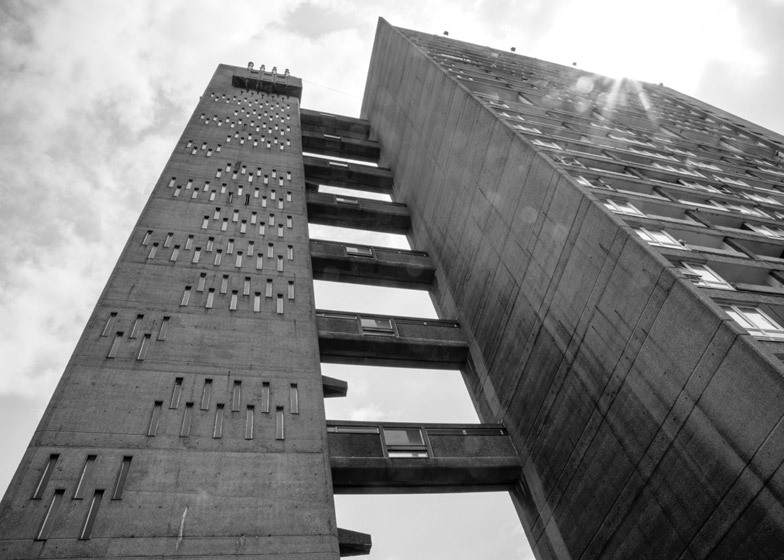 "Balfron Tower is a very sophisticated building designed by Goldfinger at the mature height of his powers," said James Dunnett, a former apprentice of the architect who now has his own practice. "It shows a refinement of spatial and social conception and of detailed design derived from his student days in the Paris of the 1920s, that birthplace of modern art, culture and design." Goldfinger had moved to London in the mid 1930s, following a spell in Paris under the influence of architects Auguste Perret and Le Corbusier, who went on to design the pioneering Unité d'Habitation. Before the war Goldfinger completed a series of private houses that included his own Hampstead residence, followed by several office and school buildings. It wasn't until 1963 that he was commissioned by London County Council for his first public housing project – the initial structure for the proposed Brownfield Estate. "With Balfron, Goldfinger was for the first time finally able to realise an idea about housing he had first exhibited at the famous Modern Architecture conference in Athens in 1933," Dunnett told Dezeen. Reinforced concrete gives the building its rigid structural grid, which visibly frames each residence. As the bridges extend across from the elevator tower they form a series of horizontal bands across the eastern facade, offering a counterpoint to the 84-metre height. There are no balconies on this eastern elevation, due to the presence of the dual carriageway, but Goldfinger still managed to create private outdoor space for every residence. Most balconies can instead be found along the western facade, overlooking St Leonard's Road. There are 146 homes overall, consisting of 136 flats and 10 two-storey maisonettes. The maisonettes occupy floors one and two, and 15 and 16, forming an obvious break in the fenestration pattern. Internally, access corridors are only located on the bridge levels. One bedroom flats are housed on these floors, with their front doors sitting next to those of larger double-aspect units that occupy the floors directly above and below. There are six homes per storey. The concrete elevator tower sits at the northern end of the site to accommodate laundry rooms and rubbish chutes, and features a series of vertical slit windows. 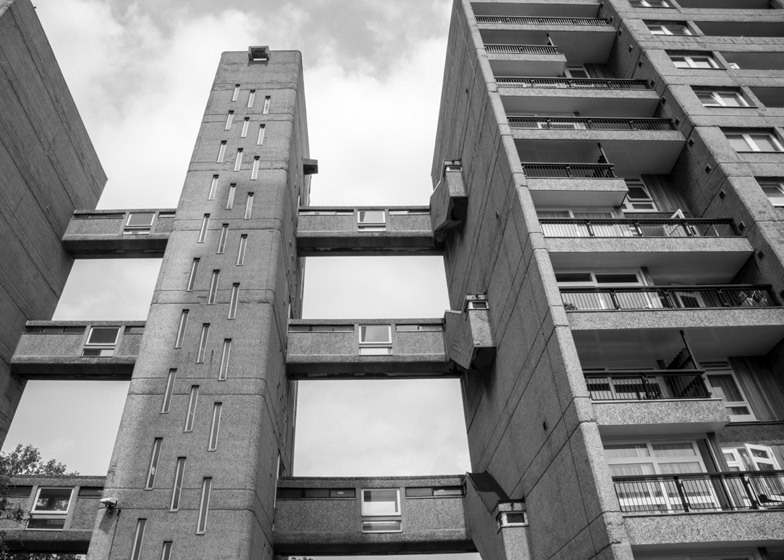 Goldfinger believed the ideas demonstrated by Balfron could offer the best of design to the masses, as an alternative to the slum housing that was still common throughout much of Britain in the 1960s. In a letter published in the Guardian at the time he explained: "The whole object of building high is to free the ground for children and grown-ups to enjoy Mother Earth and not to cover every inch with bricks and mortar." To prove the desirability of high-rise living to his critics, Goldfinger and his wife Ursula Blackwell moved into Flat 130 for two months in 1968 and threw a string of lavish parties. During this time, the architect is said to have engaged with residents about the pros and cons of the scheme. 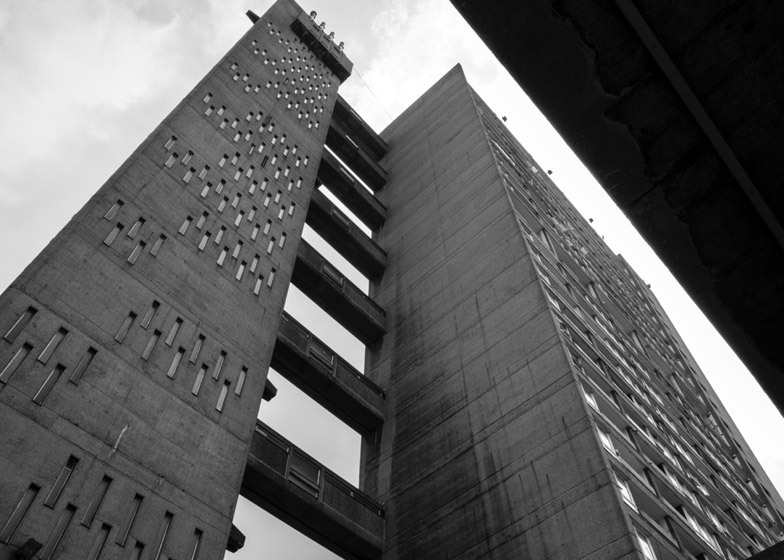 The results went into his design for the more famous Trellick Tower, completed five years later in North Kensington. 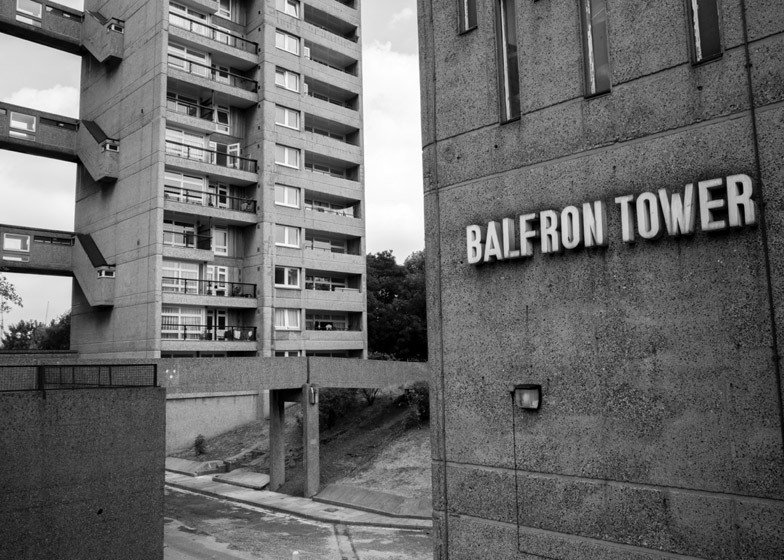 "People often forget about Balfron – it's kind of stranded on the edges of east London and doesn’t have the same notorious reputation that made its larger brother, Trellick, so well known," said Andrea Klettner, who runs the blog Love London Council Housing. "But I think the tower and the surrounding Brownfield estate form one of the most coherent sets of Brutalist buildings that are still intact in the UK," she told Dezeen. "The tower's proportions are just right and there are so many excellent features – from the underground car park, whose ceiling is made of beautifully sculpted pre-cast concrete panels, to the well-proportioned flats with generous outside space." Goldfinger also designed Carradale House, the second building completed on the estate. The base of both buildings is sunken down below the surrounding ground level, meaning the Balfron's main entrance is at the end of a bridge. The entrance hall is lined with green marble. Balfron was given a Grade II heritage listing in 1996 and the surrounding estate has been given a conservation area designation. The building is now undergoing a renovation to bring its apartments up to modern housing standards, which also presented an opportunity for a month-long arts programme. 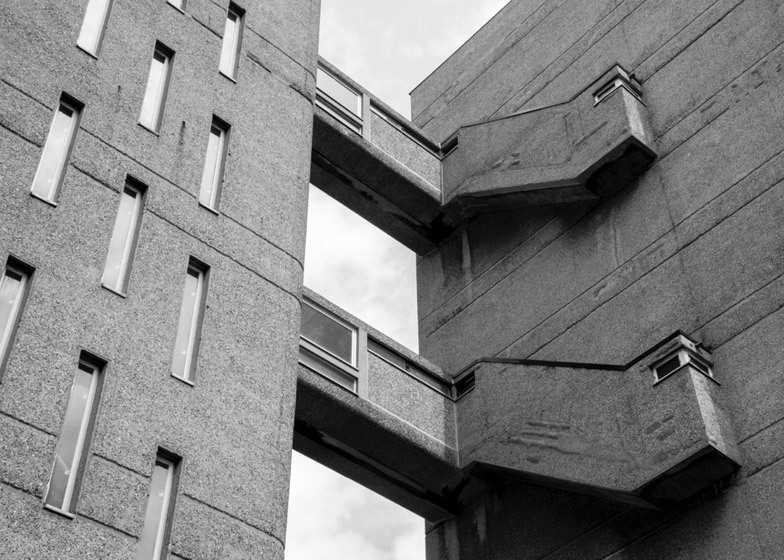 Curated by Bow Arts Trust, Balfron Season features a series of events that celebrate the life of the building and the people who have lived there. National Trust has also taken over one of the apartments – the one that Goldfinger himself lived in – and for the opening, designers Wayne and Tilly Hemingway have furnished the interior in the style of a 1968 period flat. Colour photography is by Luke Hayes.